on the face of the deep.. .
(Joy —deeper yet than woe is she! One truly lives only when one dances. 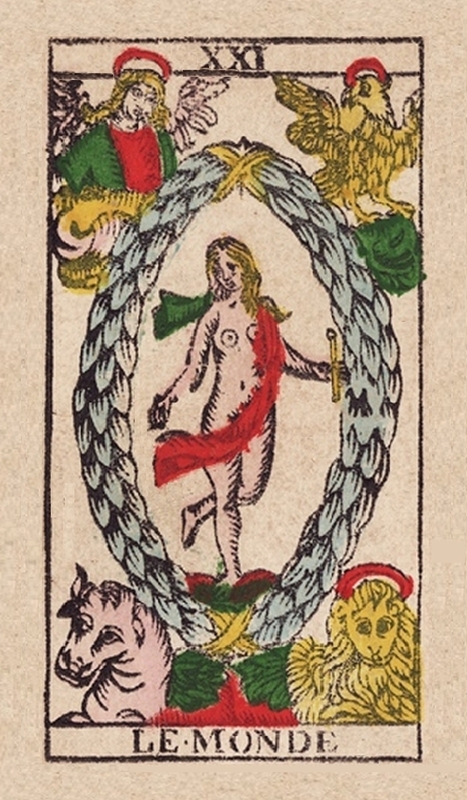 “The first ideas which come to mind in looking at the Card are those of dance, of flowering, and of the four elements . . . [suggesting] a conception of the world as rhythmic movement or dance . . . or, in other words, that the world is a work of art” (626). “Does this Arcanum want to communicate this teaching only or does it, in the manner of . . . “The Fool” [in Letter 21] also give a warning? In other words, has it also two aspects—a teaching aspect and a warning aspect? . . . May our meditation therefore be sober, and may it not let either the Arcanum’s teaching or the warning that it entails escape us” (629). “Now, the whole world is the accordance of innumerable rhythms. For its life is based on the preponderance of the accordance of particular rhythms, and not on their discordance. Thus life is basically joy” (631). “In other words, the Arcanum “The World” has a twofold meaning: it teaches that joy, i.e. the accordance of rhythms, is at the root of creation; and it warns, at the same time, of the danger of seeking for creative joy instead of for creative truth. Thus he who seeks first and foremost for creative joy will drink from the philtre the intoxicating potion of illusion . . . the sphere of mirages, whilst he who seeks first and foremost for creative truth will not only find it through the sober effort of vertical elevation but will also participate actively in the accordance of rhythms, i.e. creative joy. He will learn the way of the wand . . . traversing the sphere of mirages unperturbed (643-644). “The Arcanum “The World” is therefore that of analysis and synthesis. It teaches the an of distinguishing, within the totality of the experience of movement, the illusory from the real… (653).